This is another model from the Trimix Diver Collection. 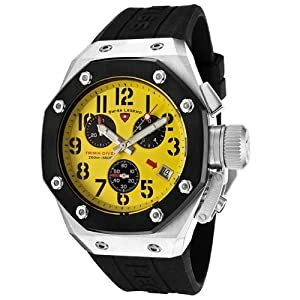 It's an unusual watch with its yellow face and tough, industrial strength look. The case is brushed stainless steel for a matte finish. The bezel is black with silver-toned screws for a accent color. The hands are luminous, which make it easier to tell time in low light. A few touches of red on the dial add to its coolness factor. The black rubber strap finishes the tough, functional look. Designed for everyday use - and who wouldn't want to wear this every day? Simply awesome.